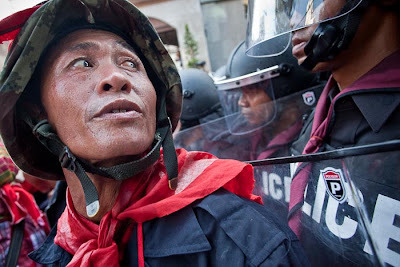 A Red Shirt security guard checks on Thai riot police arrayed behind him during the Red Shirts’ protest in Bangkok today. The simmering political tensions in the Kingdom exploded in some of the worst political violence Bangkok has seen since 1992. Troops tried to clear one of the Reds’ protest sites Saturday afternoon. Most of the troops were armed only with shields and batons. A few had rifles and shotguns but most of those were loaded with “less than lethal” rounds (blanks and rubber bullets). The Reds didn’t want to leave the area and some of them (it’s not clear how many) were armed with rifles firing real ammo. In the ensuing riot 21 people were killed - one Japanese journalist, four Thai soldiers (including a colonel) and 16 Thai civilians. It’s still not completely clear who fired live rounds first and how many live rounds were fired by security forces. By the end of the day, well after dark, the soldiers withdrew leaving their vehicles, some weapons and armored personnel carriers in the streets around Democracy Monument. All of this happened while I was in Isan working on environmental stories. I learned about it when I turned on BBC in my hotel Saturday night. It was the oddest thing. Thai TV was showing game shows and variety programs while the “Beeb” was reporting on street fighting in Bangkok with police and soldiers retreating in disarray and many deaths. Today the Reds held the funeral cortege for the 16 Red Shirts that were killed Saturday night. It was an amazing spectacle. Sixteen pickup trucks, each with a flag draped coffin in the bed and covered in flowers drove through the city and people came out to pay respects or hand roses to the surviving family members in the pickups. A Red Shirt offered me a ride on the back of his scooter and together we followed the motorcade for three hours. There were crowds at every major intersection. Bangkok is a huge city but I was struck by no matter what part of town we were in, Red supporters were there to show their grief and anger. The motorcade ended at the Prime Minister’s home, which is about a two kilometers from my apartment. Thousands of Red Shirts jammed the Soi while hundreds of riot police blocked the street, preventing them from actually reaching the PM’s home. At one point the Reds got off their trucks and rushed the barricades, pushing the police back a few meters. I was convinced the police would have to respond. But then the Reds’ security people pushed through crowd and formed a single line between the protestors and the police. And the Reds stopped pushing. They fell back a little and started taunting the police. I’ve never seen anything like it. The protestors’ security apparatus fall in to protect the police. After a while they tired of taunting the police and they left. They just stopped, turned around and walked back to the main road. This is not over yet, but I think it may have taken a step or two towards closure. This afternoon, the Thai Army Chief of Staff announced that the army would not use violence against the protestors and that the time has come for the Prime Minister to dissolve parliament and call new elections. It’s not actually a coup, I don’t know what it is when the Army says they won’t follow the orders of the elected leaders and instead call on the leader to resign. Sort of a coup? And the Thai election commission ruled that Thailand’s Democrat Party, the country’s oldest political party, illegally accepted a secret $7.9 million (US) campaign donation. The commission is moving through the courts to have the party banned and dissolved. This would effectively force Prime Minister Abhisit Vejjajiva out of office, which is exactly what the Red Shirts want. The question now is will the Reds wait for the process to work itself out? There are more photos from today’s motorcades in my PhotoShelter archive and available from ZUMA Press.